Hey everybody! Welcome to another edition of Mastication Monologues! While I’m still here keeping it cool and kickin’ it live in South Korea, I am slowly but surely winding down the last of my Chinese adventure posts where I try some weird and wacky foods that you just can’t find in Korea or anywhere else for that matter. Today is a bit on the tamer side where I started off my day with a typical Taiwanese breakfast with my friend David’s family. We went to a really small place that specialized in three key elements of a Taipei breakfast: fantuan, youtiao, and soy milk. First, there is the youtiao. A lot of people back home in the States skip breakfast because they’re in a hurry or just don’t feel like whipping up a bowl of cereal (as if that takes a long time). 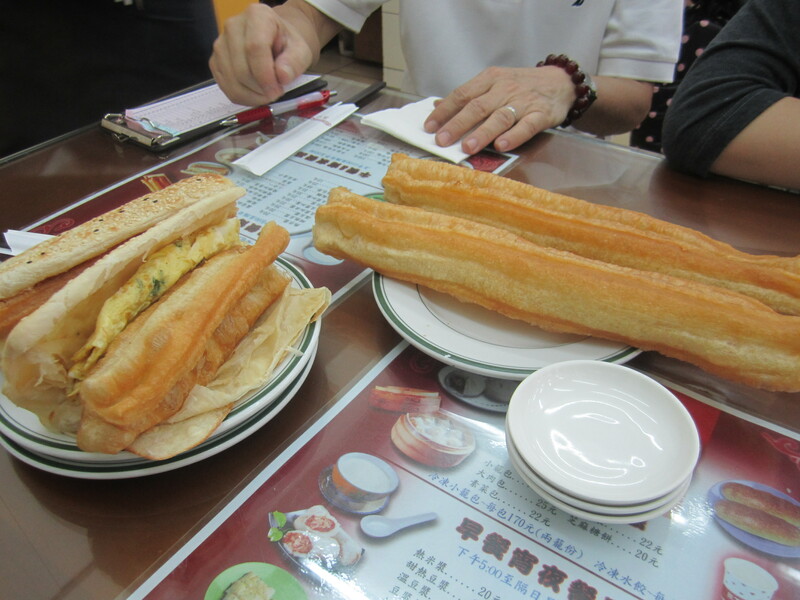 In Taipei, you can get the youtiao to go, and I know I would make it an occasional part of my morning routine. The reason being is that youtiao is basically fried dough or the Taiwanese version of a doughnut. Fried dough and milk? I’ll take it! You can eat it plain or dip it in some soy sauce if you’re looking for a savory side to your doughnut. It wasn’t sugary at all like Western doughnuts, but it had a rich, buttery flavor and was not sopping in grease which was refreshing. We even got a more modernized version of it with a piece of youtiao and a mini egg and green onion omelet stuffed inside a sesame and poppy seed coated flatbread which is called shāobǐng yóutiáo (燒餅油條) or youtiao flatbread. I could only relate it back to a heartier and better version of the Egg McMuffin. The flatbread was light and airy while the sesame seeds interacted well with the green onions in the eggs. The other part of my breakfast was a fantuan which consisted of the aforementioned youtiao, pork floss, and pickled radish encapsulated in a layer of sticky rice. While it was roughly the size of a potato, I was full after eating just one. The cooks packed in a lot of tender, savory pork along with old, stiff youtiao that provided a spine of stability to the otherwise squishy foodstuff. I washed all of it down with a iced cup of soymilk which was slightly sweetened but still maintained an earthiness that reminded me that I was drinking soybeans. You can get your soymilk either iced or served warm in a bowl on the side like soup. 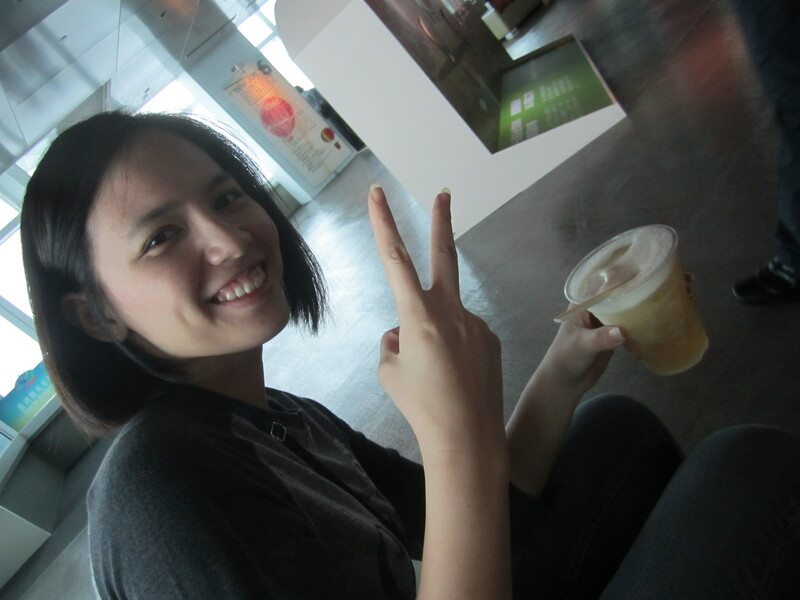 Once we filled up on a lot of deep fried carbs, Christie and I were off again on another sight seeing adventure which would eventually bring us to the top of the Taipei 101 tower where we tried a beer float since we had two for one coupons. 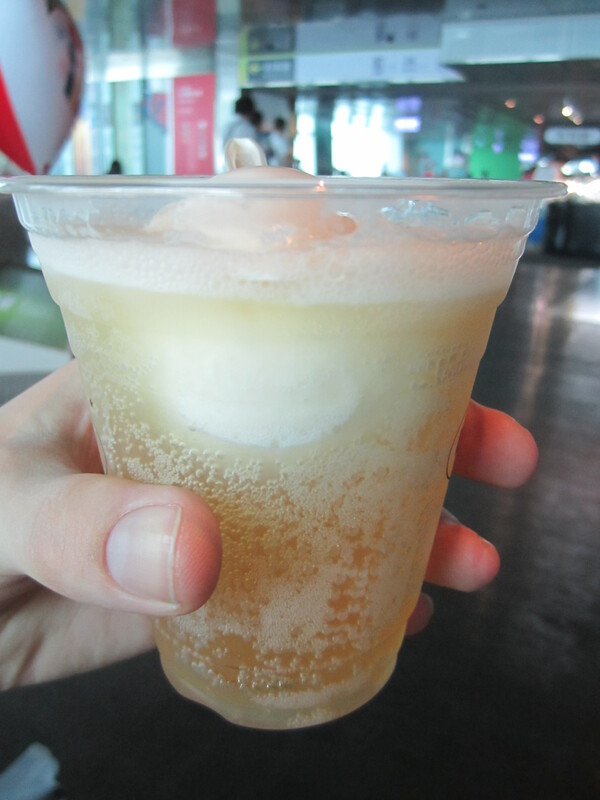 It was pretty much a cup of Taiwanese beer with a scoop of vanilla ice cream in it. It wasn’t anything special, but it got better towards the end when the ice cream melted and blended with the light lager. After the Taipei 101 Tower while we were walking and talking, I brought up how much I enjoyed taro root in my boba tea, so she took me to a dessert stand that was kind of like a make-your-own-sundae but focused mainly on taro root paste. For about 200 TWD, you can get three different ingredients in your bowl. 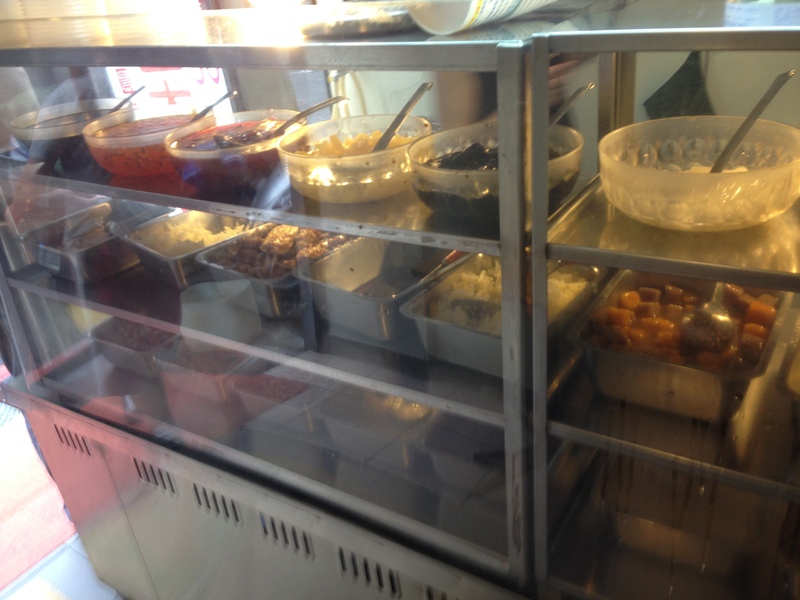 I picked the taro root paste, tapioca balls, and pineapple. 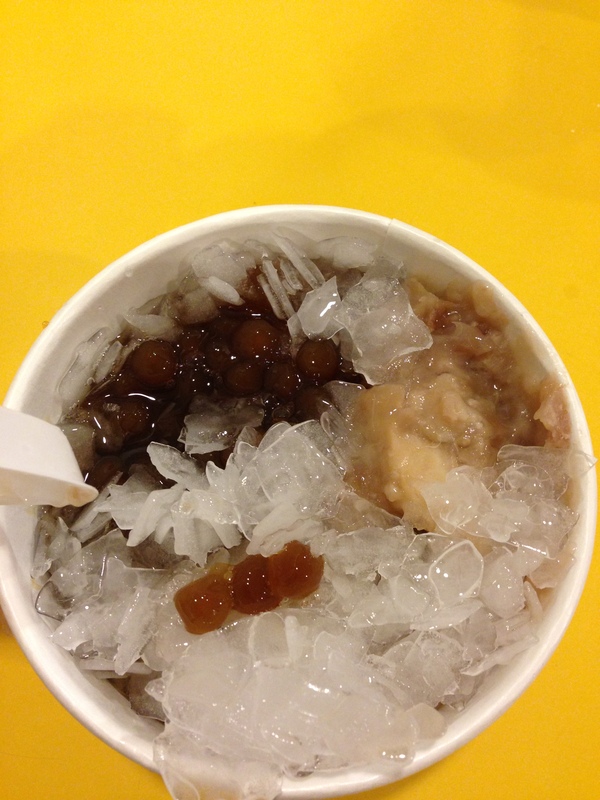 They had other ingredients like this clear jelly, kiwi slices, and red bean paste to name a few. They lumped all of it into a bowl along with some shaved ice so that it became more like a soup I had to scoop into my mouth. Obviously, my favorite part was the tapioca balls because they were chewy and sugary, but the lumpy taro root kind of put a damper on my sugar rush since it was just a lumbering giant in a room of nimble tapioca sprites. Another sweet deal (pun intended) that they don’t charge you for is you can add as much ice and sugar syrup to your dessert. I didn’t think mine was that sweet, so I gave it another ladle full of the syrup. It was a bad choice. I could only finish 3/4ths of it before I had to stop because it felt like my teeth were going to fall out, and I was about to have insta-Diabetes. Word to the wise and Lil’ Wayne, go easy on the syrup. I didn’t eat anything after that, and we had a brisk walk to multiple parks and temples before sitting down with the family for a late dinner in the middle of a typhoon rainstorm. 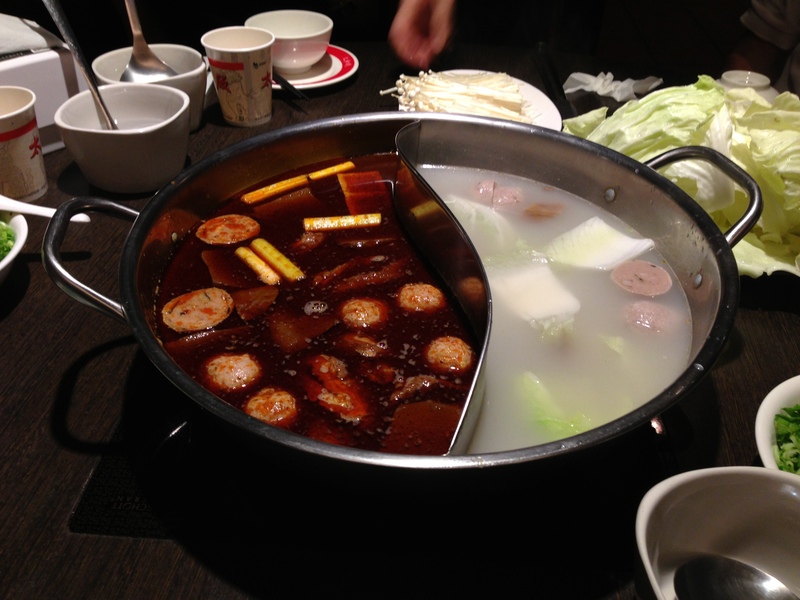 This dinner was like deja-vu for me once again because we were having hot pot. I had had it before with the Wu family on New Year’s Eve 2012, and it had more of a spicy flair to it thanks to the Sichuan peppers they used in the pot. However, Christie couldn’t take the really spicy stuff, so we only had a medium spice level on one side and a mild broth on the other. However, that didn’t stop me from trying some new items on the menu like ligaments, Mitsuyaki jelly, and shrimp paste tempura. 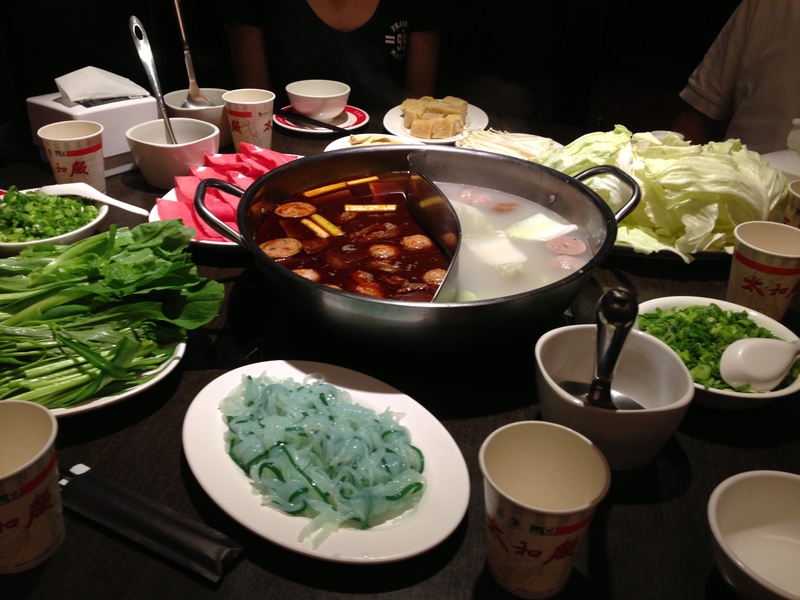 How hot pot works is that you literally have a pot that is heated until boiling in the middle of the table, and then you throw everything in and eat it when it’s fully cooked. Easy peasy. I personally preferred the spicier side, per usual, and the contents of the pot did not disappoint. For my first plate, I went all meat lovers on it. I had duck blood which was as good as the Moon Cake dinner’s version but a bit spicier due to the broth it had been simmering in. Then there was the pork and beef which were high quality cuts with very little fat and sliced almost paper thin to almost dissolve on the tongue. Then there were my ligaments. Now, they might sound like some terrible eats, but I have to disagree. True, it may have taken a bit of chewing, but the rubbery texture gives way eventually and soaks up a lot of the flavor from the other meats bobbing in the devilish red soup. When I was done gnashing away on the ligaments, I moved on to my second plate. 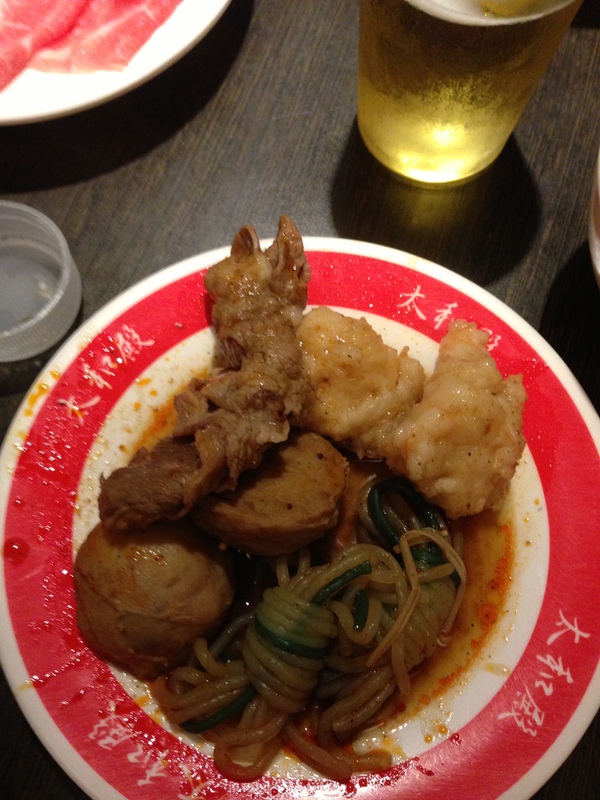 Here we can see the pork meatballs that were original residents in the spicy side of the bowl until I relocated their savory and seasoned selves to a new one floor house in my stomach. Then there were the nuggets of shrimp paste that congealed and cooked in the spicy broth to create small shrimp clumps that tasted fried yet were boiled. The lamb was on par with the beef and pork. 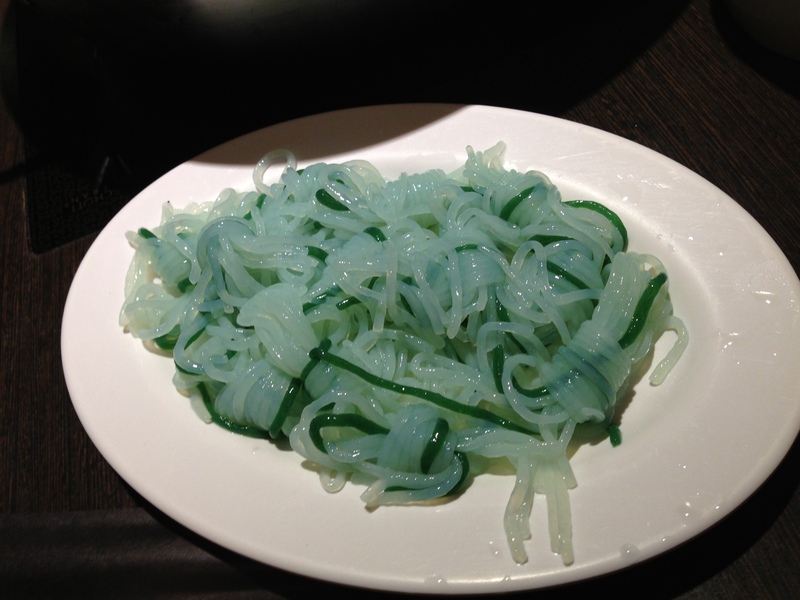 The final part of my plate consisted of the jelly noodles that I had never seen before. They weren’t really that different from other Asian noodles in terms of taste and texture, but they looked more gelatinous and almost alien-like with their pre-cooked color compared to their more beige-hued state after stewing in the spicy broth. Then there was my drink that was unlike anything I’ve ever had. Darker the berry, the sweeter the juice. Yeah, right. 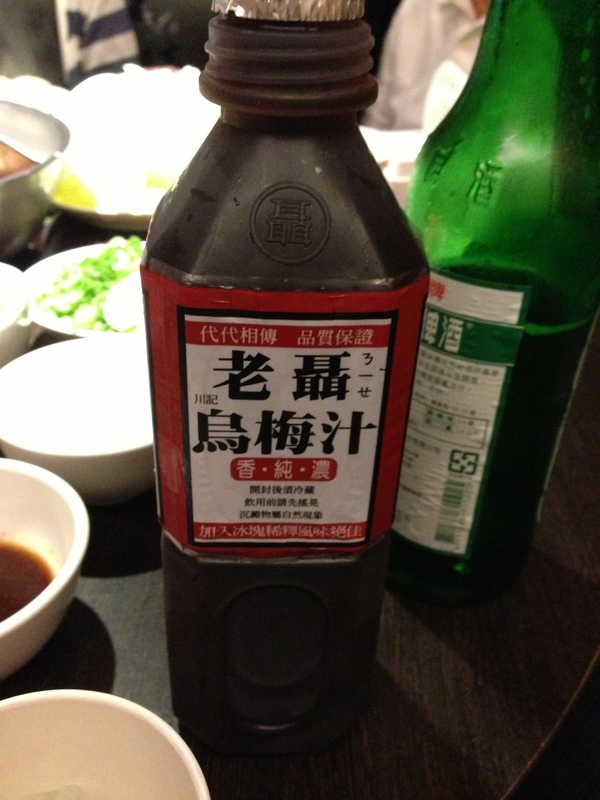 To get drinks in this hot pot restaurant, you just got up and grabbed a bottle from the back freezers. I saw normal stuff like Lipton iced tea and lemonade, but I saw a dark bottle with everything written in Chinese. Naturally, I took the plunge. It was an experience right off the bat. First, to open the bottle, you had to use a sharp edge on the top of the cap to open the safety seal over the mouth of the bottle. Then as I poured the extremely dark brown liquid into my cup, my dining companions informed me that it was plum juice, but I must drink it with ice to combat the strong taste. I thought, ‘Really? I thought plums were supposed to be sweet, and I love plums. How bad could it be?’ It was unlike any plum I have ever tasted. Instead, it tasted like I was drinking a bottle of barbecue sauce. I don’t know if the ice mitigated any of the strong flavor, but it had all the smoky, mesquite-tinged makings of a grade A sauce to slap on a rack of ribs or some chicken breast. That was a strange finish to an otherwise flawless dinner, and my night didn’t end there as I went out to two clubs in Taiwan while walking though a typhoon multiple times in the process. If it wasn’t for my strong “plum” juice, I’d have withered in the face of the howling wind and rain instead of getting my groove on. 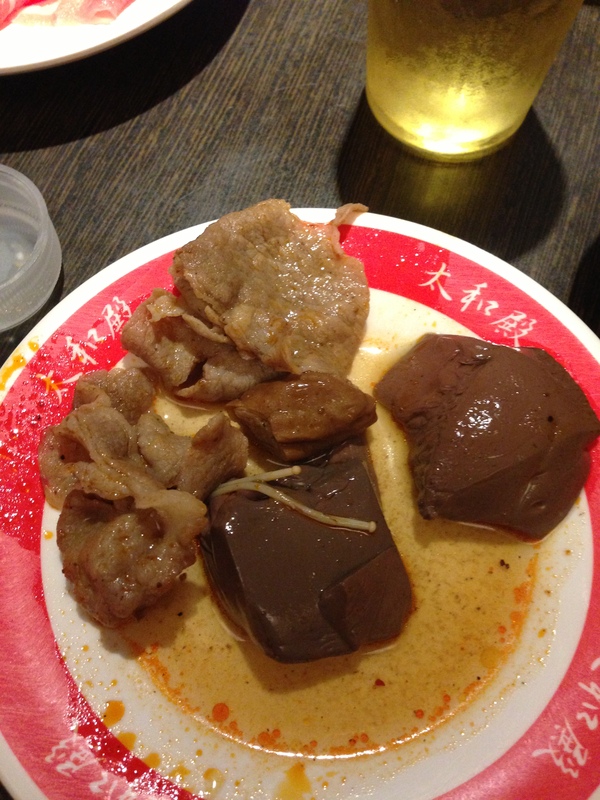 Next up, the last chapter in my Taiwan adventures where I eat the head of an animal. A capybara? A rabbit? A rat? You’ll just have to wait and see! 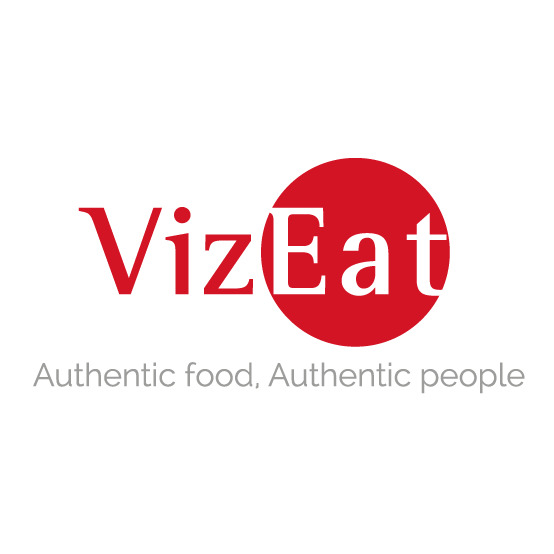 Posted in Alcoholic, Beer, Beverages, Breakfast, Chinese, Far East Asian Cuisine, Hot Pot, Non-Alcoholic and tagged blood, breakfast, Chinese, dining, eggs, Food, fried, hot pot, noodles, Sandwich. Bookmark the permalink. The duck blood looked interesting, does it have a coppery taste like blood, or do the spices balance it out? Weird question, I know. I’m just curious of the taste. 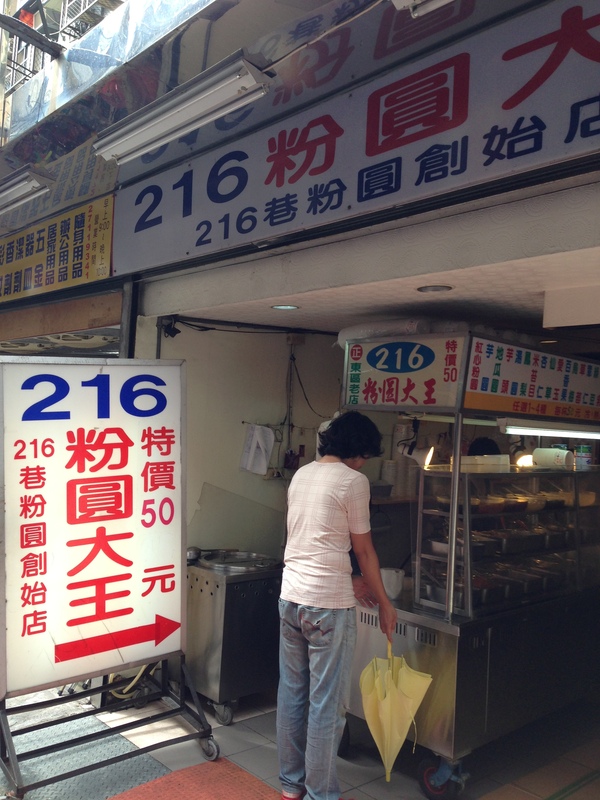 I would love to try the Taiwanese beer….and the fried dough, I think I’ll pass on the liver.